Mix 2 boxes of Manischewitz® Potato Pancake Mix according to box directions (combine mix, 4 large eggs and 4 1/2 cups water) in large bowl. 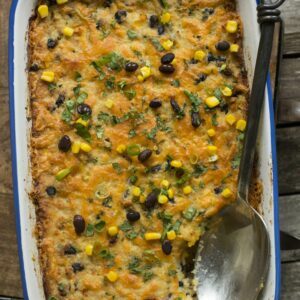 Add drained chiles, corn, black beans and 1 1/4 cup cheese to mixture. Grease bottom of glass baking dish with 2 tablespoons oil. Pour potato mixture into baking dish. Drizzle 2 tablespoons of oil on top of potato mixture. Bake in 425 degree F oven for 30 minutes. After 30 minutes, sprinkle remaining cheese on kugel and bake an additional 15 minutes.